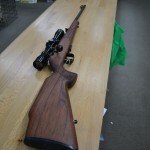 This PWS .22LR Rifle is the most fun you can have at the range. With its ergonomic design and strait pull loading for repeat shots , cost effective, fantastic. The PWS T3 22LR 10 SHOT is a Match Grade set-up with a carbon fibre threaded barrel. The image shown has a T-Rex laminated stock fitted for comfort. The PWS T3 also comes with an adjustable trigger for customization to suit the user. This .22 Rifle is the most fun you can have at the range with its ergonomic design and strait pull loading for repeat shots , cost effective, fantastic.